يشكل Lake St Clair Lodge بموقعه الممتاز في كرادل ماونتاين نقطة انطلاق جيدة لاستكشاف هذه المدينة النابضة بالحياة. يمكن من هنا للضيوف الاستمتاع بسهولة الوصول إلى كل ما تقدمه هذه المدينة النابضة بالحياة. يشكل هذا الفندق ملاذاَ مريحاً للاسترخاء ويمنح زواره فرصة للاستجمام والتجدد، وهو يقع على بعد خطوات من المعالم السياحية الكثيرة للمدينة كمثل: جسر دروينت, Lake St. Clair. كما يقدم Lake St Clair Lodge الكثير من الخدمات لإغناء رحلتك في كرادل ماونتاين. يقدم هذا الفندق العديد من الخدمات الكفيلة بإرضاء أكثر الضيوف تطلباً. في الفندق غرف نوم يتجاوز عددها 42، كلها مجهزة بعناية وجمال وبعضها مزود بـ حوض الاسترخاء, غرف لغير المدخنين, تدفئة, مكتب, شرفة/ تراس. يقدم الفندق مجموعة واسعة من وسائل الراحة المتنوعة، كمثل: حديقة, رياضات مائية (غير آلية). إن Lake St Clair Lodge هو خيار ذكي بالنسبة للمسافرين إلى كرادل ماونتاين، بما يوفره من إقامة هادئة ومرحة. even the hotel is slightly pricy, i must say i will come back again if i will go to tasmania again. the only thing is the junior staff. I think the handling of different scenario is not mature enough. thanks a lot for the manager who can cover all the problem for them. hard work for the manager! World Heritage, a special part of Tassie. Pristine. The number of short and long walks in the area are amazing. The cabin accommodation was excellent. The meals were all very good given the circumstances the kitchen staff had to work under. There was not enough staff on in the restaurant and the 4 that were on when we were there for 2 days worked like Trojans trying cover off taking orders, cooking, bar tendering, cleaning up. They deserve an award. Management need a boot up the bum. $10 for a beer/cider is a rip off. It’s not like the place is in the middle of central Australia 1000s of is from its distributors. Breakfast is passable. The cruise on the lake is a misnomer (it’s a boat ride to one end of the lake to pick up hikers) and way overpriced at $70. However the sights you see on the lake are truly remarkable. We were there when it was unusually 30C - the restaurant was like a sauna so we ate outside. This international company is taking advantage of its superb location. Rooms are sparsely furnished, the kitchenette has a sink (with a tap) and a mini fridge. But the rooms are poorly cleaned and for $300 per night are very poorly appointed. Food at the restaurant is poor and staff are very average. Pros - the location is beautiful, with lodge cabins situated nearby/alongside the lake. We had a nice view out to the lake. Cons - this was our belated honeymoon which we mentioned in our booking, and it wasn’t acknowledged at the very least by staff; the bathroom lights were missing 1 fitting, and 2 others were mismatched; came with a single mini fridge which wasn’t cold; no internet service; restaurant food was overpriced and unspectacular; there were multiple walkways around our cabin one of which went past a window looking directly onto our bed. What stood out for us? The amazing location. They certainly have a monopoly for being right in the National Park. The many people that go through the visitor centre and lodge after completing the Overland Track I think would be happy with the accommodation options. The cabin was very comfortable with a beautiful view of the Lake. Easy access to the bushwalks and a boat trip on the Lake. Cabins are a little on the expensive side but that was expected due to the remote location. Dinner at the restaurant was good but also slightly expensive but that is part of travelling to these locations. Staff were very friendly and I enjoyed my night here. The weather was freezing and I had snow in November one morning. Be prepared for all conditions. We stayed at the Lake St Clair Lodge Wilderness Suite. The suite was cosy and had a fireplace, kitchenette and jacuzzi bath. The location of the lodge is very close to Lake St Clair so you can enjoy a breathtaking view of the lake. The Lake St Clair National Park Visitor Centre is also at the Lodge so you can easily purchase the park passes if you intend on walking around the Lake St Clair-Cradle Mountain National Park. There are many short walks which you can take and return to the Lodge within the same day. It is recommended to do some of these walks but do plan for the activity. As some of the suites are far away from parking areas you may need to carry your bags some distance. There is only one restaurant at the Lodge and it is at the Visitor Centre. Everything was perfect. The room was way exceeds our expectations- very big, modern and clean. The most comfortable bed through out our trip. Because of the reviews so we have prepared out own food, but we were offered Boxing Day menu for dinner up on arrival and it looks good. Although we didn't try it but when we walk pass the restrant we see guests enjoying the dinner n there was live music as well. This place truly worth to stay! Location, friendly staff, cosy room. This accommodation is situated just next to the visitor's center of Lake St. Clair. There was quite a number of cabins available. Although the lodge was situated in the park, the lodge was modern in design with magnetic key card access. This is one of the most cosy accommodation during the winter that I had stayed in, even the toilet wasn't that cold. The only problem is with the refrigerator lighting that came through its glass door and sleeping with that on was quite irritating. There was no wifi as expected. Parking is available and right next to the cabin itself. The reception had requested the restaurant to stay open as we informed that we would be having dinner there. Even the restaurant staff was very service oriented. Walks start from the visitors center and it was not too far from our cabin. Good base for walks at Lake St. Clair. Having stayed in Tasmania for nearly 2 weeks in different hotels and lodges the Lake St Clair lodge was by far the worst disappointment of our entire holiday. The rate of our stay at the lidge was on average twice the one we paid for in other lodges and hotels. After a long drive, we expected to have nothing else than a comfortable cabin with a lavush view on the lake. Instead, we found ourself in a small room in a semi-cabin with no view whatsoever. A real disappointment for a $ 300 rated stay and while a fair comparative rate should have been in the order of $ 110, one could easy call this to be a rip-off. Also while the restaurant is shared with a café used by camping visitors, the prices of the mains were on average $ 45-55. One could expect this in Guillaume restaurant at the Sydney Opera House but certainly not in this setting. Overall, our stay at the Lake St Clair lodge was by far the poorest value for money of all our stays in Tasmania and we would certainly not recommend it. Cabins were lovely and surrounded by beautiful scenery. Unfortunately over our 2 night stay it was never serviced. The restaurant was okay but as the staff all appeared to be Chinese with limited English ordering food was a challenge. That would be acceptable in China but not in Australia! Last night in Tasmania ,Lake St Clair Lodge is special.Not value for money definitely but it was a good memory.Cabin clean and big,around the bushes and beside the lake.Enjoy the day and free breakfast! The staff was very helpful when we had problems with the heat stove. They came right away on fix it. The breakfasts were good each morning included in the prices. We loved staying in the park with everything right there including the Visitors Center. Great walks from the Visitors Center and a boat ride to the end of the lake. Saw lots of animals especially at night. Must go. visit The Wall while you are there. Fridge sounded like a freight-train all thru the night. Bed was very comfy though so eventually got to sleep. The best gins I have EVER tasted (if you don’t mind paying $20 each ... which I did many times) and pizza was delicious. Dilapidated 2br loft cabin accommodation that needed serious attention in terms of cleaning and repair. 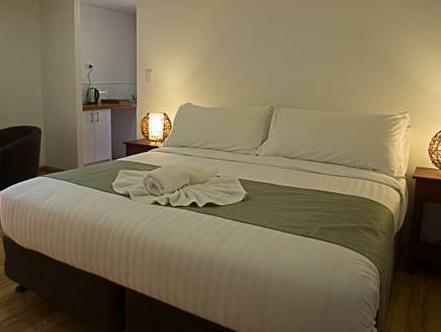 Excessively over-priced for standard provided and compared to similar accommodation in offer at other end of overland track (Cradle Mountain). Lake is truly beautiful but stay somewhere else nearby for significantly less and visit each day instead as access is similar regardless of whether you are staying there or a day visitor to the Lake. Staff all need more training in customer service and at least one copy of menus from restaurants should be available for guests staying in the cabins. The room was beautiful and luxurious. Wished we could have stayed longer. Love the balcony with the view of the lake. Really nice breakfast that came with the package. well build and maintain at side of Lake St clair. restaurant serving good and delicious foods.